The Mobile Environmental Justice Action Coalition is a partner of Public Lab on the NAS project, and in conversations leading up to this first workshop in the Mobile area under the NAS grant, it was decided that the initial work with Public Lab in the area should focus on promoting the Blueway that's designed to go through the Africatown community into Prichard, AL. Over a series of phone calls, we set an initial workshop with the Blueway group learn about Public Lab, and to identify where the goals of the Blueway would be furthered through community engagement in Public Lab workshops. For this meeting, we ran through goal setting activities that helped us together define the goals of collaboration, define what should happen in the community workshop space, and identify what would need to happen in preparation for the community workshops. 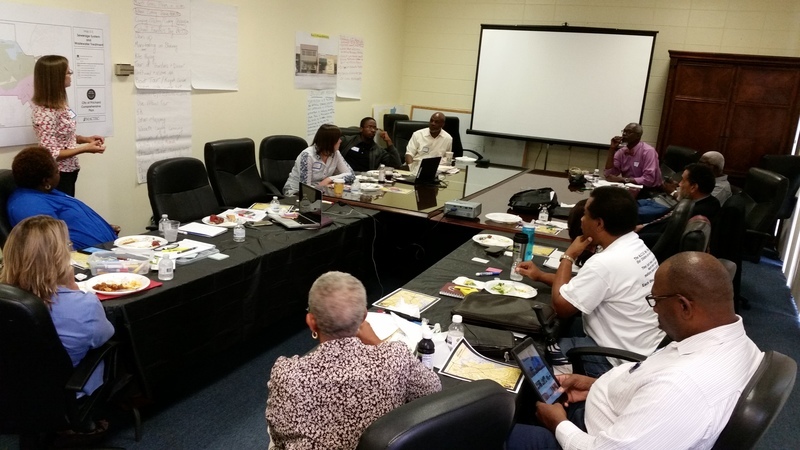 The Strategy Room at City Hall in Prichard, Alabama on August 29, 2017 was the site for the first in a series of workshops. The participants were warmly greeted by The Honorable Jimmie Gardner, Mayor of Prichard, AL, and City Councilwoman Ossia Edwards. Other organizational representatives in the Goal Setting Workshop included the Mobile Environmental Justice Action Coalition's (MEJAC) Ramsey Sprague, Nashid Rushdan & Arianna M'Arthur; the City of Prichard's Crendetta Ward and Kim Green; the Mobile County Training School Alumni Association's Joe Womack & Anderson Flen; Yorktown Church's Chris Williams, Sr.; Groundwork Mobile's Larissa Graham; Alliance Institute's Stephen Bradberry; Alabama Coastal Foundation's Valerie Longa and the Center for Fair Housing's Teresa Bettis. The National Park Service's (NPS) Liz Smith-Incer serves as the facilitator for the Blueway initiative, assisted by NPS-Atlanta representative, Joshua Tuck. The workshop was facilitated by @Stevie Lewis and @Gilbert Rochon. "Our mission is to preserve the natural spaces, habitat, and waterways of historic Africatown in Mobile, AL, Africatown State Park in Prichard, AL and the 10 miles of Chickasaw Creek connecting the two, for the sustainability of healthy communities, educational enlightenment, and economic opportunities." Promote educational activities that bring great awareness, appreciation and access to Africatown. Create a safe and attractive Blueway that highlights key points of interest along Chickasaw Creek. Host activities that promote economic enhancement of Africatown. Promote the water trail as a valuable, sensitive resource for recreation, water safety, education and stewardship. Identify access and opportunities for boaters in the form of, but not limited to portages, launches, campsites and available services. Encourage partnerships between government agencies, businesses, non-profit organizations and the public. Identify and pursue ways the water trail can become economically beneficial. Connect with broader community science practitioners across the Gulf of Mexico region. Visualize and communicate data on local environments. After reviewing these, workshop participants were asked with the goals of the Blueway project in mind, and the goals of Public Lab workshops, what do you see as the main overarching goals for community workshops on the Blueway with Public Lab? Participants recorded these on sticky notes individually, then we shared them out as a group. These results were then reduced and compiled to define the collective over arching goals. (This activity was based off of the "One, Some, Many" activity found in the gardening toolkit on Public Lab found here). Helping people to think about advocacy related to environmental issues (and the Blueway resources). After defining the overarching goals, we worked to brainstorm what activities could be done in an event setting. Then we reviewed our brainstorm against the goals we collectively set and picked which ones best matched our goals. (This activity was based off of an activity found here on Public Lab on evaluating advocacy pathways. Consensus was reached that outside of the regular Blueway events, we would focus on two workshops. These workshops would both focused on community engagement around the blueway and training people on how they could get involved monitoring the blueway. One of the workshops would be around balloon and kite mapping, the second workshop would be around water quality monitoring. Stay tuned on planning for these workshops. Our next steps are to put together a one-pager on the balloon/kite mapping workshop, set the location and date (we're leaning towards October 20th), do specific outreach to local teachers, and invite the broader community. Ultimately, we're hoping these workshops, and subsequently monitoring produce data that can be shared at the Blueway Ribbon Cutting Ceremony in June next year!